Just for fun, I thought I’d post my dinner tonight. Olives and Coke. And for dessert, brownie batter (by the time the brownies were done I didn’t want any more chocolate so I haven’t even tried them yet). 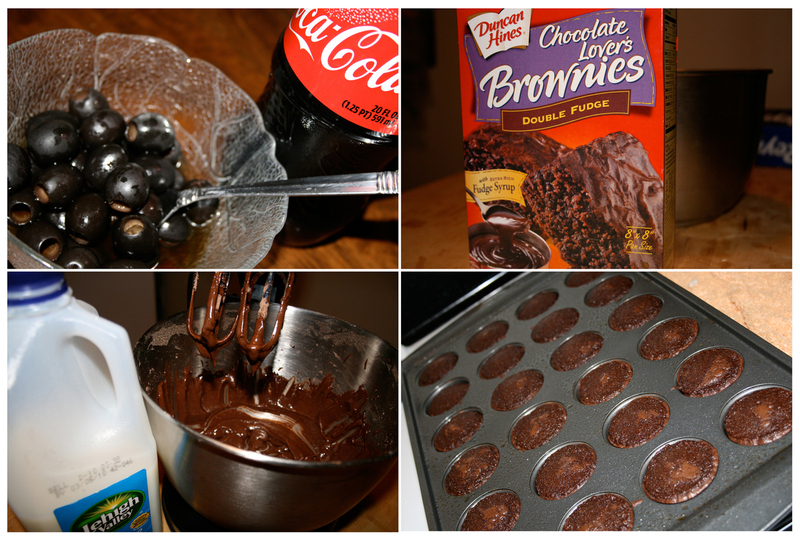 I have to say, boxed brownies are the best. A few weeks ago I attempted to make homemade brownies and they turned out disgusting. I must have done something wrong because I’m pretty sure I’ve had other people’s homemade brownies and loved them. Regardless, I’m still a fan of Duncan Hines. I always make them in the mini cupcake pan to create bite sized brownies. When I eat them, I top them with chocolate frosting and those crunchy little ball sprinkles. I probably should have posted a pic of that because it’s cute, but I forgot to purchase the frosting this time. The dinner of olives and coke was delicious though! I ate the whole can of black olives. This entry was posted on February 23, 2010. It was filed under Other. I LOVE olives… but in coke? … how is this not gross? Dude, not IN coke, WITH coke. How did you no get that? Coke was my drink. Olives were my meal.